Step 1. Be really excited that Mami is playing with you. Step 2. Realize that you need to pee. Step 3. Fight it with all your might and keep playing. Step 4. Ignore Mami’s suggestion that you need to pee. Step 5. Pee in the bookcase when you can’t take it anymore. Today I tried to take advantage that Vic took the older two to the park so that Sweet Coco and I could do Floortime. I haven’t really developed a Floortime schedule or anything but I figured I’d better start whenever I get the chance even if we don’t end up having a full session. This session lasted about 8-10 minutes (see above quote). We played Fetch using the above stress ball. Sweet Coco has been drawn to the ball lately and likes to squeeze it and throw it around. Today it was pretty easy for him to share it with me. We began by playing catch but he was too excited to maintain a “throwing distance” and opted instead to just hand me the ball. He was also too excited after the first few minutes to maintain a “catching distance”, opting to stand right in front of me after handing me the ball. So I started throwing the ball across the room and enthusiastically asking him to bring me the ball. Whenever he did it I would clap and say, “Yay!” Yay is a big motivator for him. It was for Kamikaze too. Tremendo on the other hand seemed to hate cheering/praise until very recently. During the session Sweet Coco also said, “catch”, “throw”, “ball” and “go get it”. Him running after the ball instead of just catching it helped him get exercise which is important because he has low muscle tone. Running after the ball and finding it also helps his visual perception. He has to scan the room or follow the ball with his eyes to see where it lands. And most in line with the Floortime goals, he’s opening and closing circles of communication every time he goes after the ball and brings it back to me. I’ll start expanding this game by working up to having him say, “Go” or “Throw” when he’s waiting for the ball. I purchased Engaging Autism: Using the Floortime Approach to Help Children Relate, Communicate, and Think by Stanley Greenspan in order to get more inspiration. 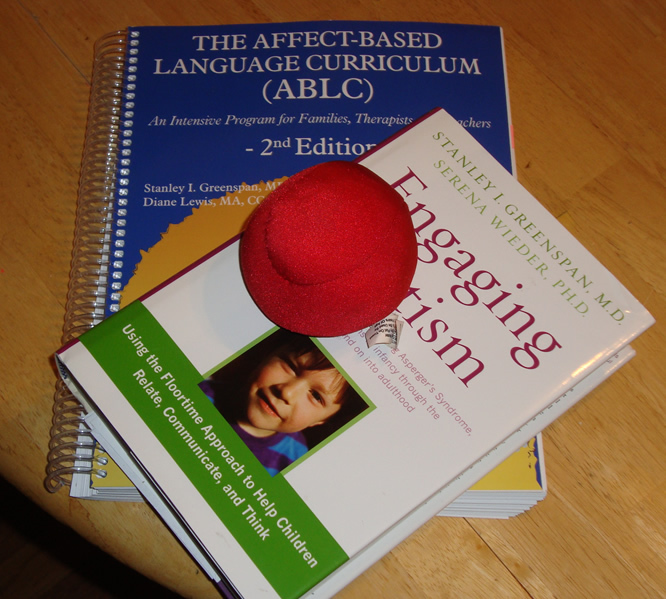 I also got The Affect-Based Language Curriculum [ABLC]: An Interactive Program for Families, Therapists and Teachers (2nd edition) which is also by Stanley Greenspan. I decided to get the ABLC because I learned that it is intended for use at home regardless of now non-verbal the child is. I probably could’ve also used this a couple of years ago but I had already bought Teach Me Language (which I ended up not using because according to the introduction, a child must be labeling and repeating consistently in order for the program to work). Something that makes me excited about the ABLC is the emotional/affect component. I have noticed that Tremendo and Sweet Coco are more likely to talk if they are upset about and demanding something. So obviously keying into positive emotions while encouraging speech will help them produce more language in pleasant contexts. 2 Responses to "How to End a Floortime Session by Sweet Coco"
I stumbled upon this site just now…I have a brother with Autism who has been homeschooled for two years. It is really working very well for him, he doesn’t have to dread going to normal school anymore. Thanks for commenting. I’m glad your family is able to give your brother the peace of mind of a home education.